Tai Chi Chuan is a complete system of Chinese Kung Fu. It has a long documented history of almost 400 years and is now the most widely practiced martial art in the world. The theory it is based upon is thousands of years old. The Praying Mantis-Tai Chi Center teaches the Traditional Yang style long form, Toi Sao (two-person sensitivity exercises), Sahn Sao (two person self-defense fighting applications, meditative breathing exercises combined with Chinese Acupuncture Medical Theory for health and internal development, as well as the Tai Chi Gim (double edged sword), Tai Chi Do (Single Saber) and other weapons. Tai Chi utilizes Yin/Yang theory and relies on sensitivity. This enables the borrowing of your opponent’s force. The more force an opponent uses against a Tai Chi practitioner, the more force will be returned back upon them. Its self-defense strategy is to allow your opponent to come in and make contact with you so you can “interpret” or “listen” (called “Ting Ging” in Chinese) to their force, and thus control, deflect, and lead their force/body into a disadvantageous position (empty them). Then the Tai Chi practitioner will add some of their own power and return all that focused power as a counter attack to defeat their opponent. The counter attack is perfectly timed to be executed precisely as the opponent has been lead into an empty, weak, off-balanced and overextended position, or, at the precise instant when the opponent begins to retreat. The Toi Sao (two-person push hands sensitivity exercises) are specifically designed to develop “Ting Ging”, to hone the practitioner’s degree and level of sensitivity to be able to instantly change their attack strategy, based on the reactions of the opponent. The Tai Chi Sahn Sao exercises the ability to keep the mind calm and develops the practitioner’s reflexes or “proper reaction”. These are two-person exercises which utilize self-defense techniques extracted directly from the Tai Chi Form. By building good reflex ability the practitioner is able to react instantly without thinking and be able to employ the most effective counter attack technique to any particular attack. Learning the Tai Chi form and performing it correctly takes time, patience and perhaps years of practice and concentration. At first the long form is practiced as slowly as possible to develop physical strength, balance, self control, and the ability to be aware of all the parts of your own body, which is referred to as “conscious movement”. You should be fully aware of the position and movement of your entire body at all times. This practice is likened to “moving mediation”. Its slow and gentle practice greatly improves mental calmness, and greatly reduces stress which is the number one cause of disease in the world. The body is moved consciously by the mind, being combined with deep rhythmic breathing. This process promotes further relaxing and calming of the body and the intellectual mind which builds up Spirit and internal power and health. At first this form is practiced slow, thereby developing strong legs, body coordination, agility, balance, control and flexibility. But when self-defense becomes necessary, the Tai Chi fighting techniques are delivered with extreme lightning speed, and devastating power. After the form or posture is learned the student should know how to apply the technique effectively. If the form is incorrect the application will not work. Tai Chi posture requires through relaxation that the lower spine of the body be dropped and the head is held as if it is suspended from above, the chest concave, back lifted, the shoulders open and elbows dropped, which, together allows for the proper ability to deflect or to redirect any oncoming attacks and to be able to properly apply Tai Chi’s self-defense applications without the use of “force against force”. Once your body is familiar with moving correctly, maintaining the Tai Chi posture throughout the form, and you become familiar enough with the form sequence, you can further enjoy the health benefits of the Tai Chi Form. By allowing the bottom of the spine to hang down and the head to be suspended, the vertebrae of the spine are elongated and gently stretched allowing for more blood, oxygen and Chi energy to flow through the spine and to the body and brain. The waist and buttock muscles should never be tensed or the flow of Chi oxygen and blood will become restricted or stagnant. 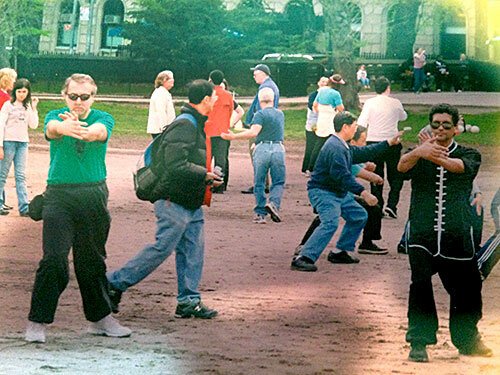 What a novice observer sees while viewing the Tai Chi form does not necessarily reveal the true nature or application of the movements. All the Tai Chi postures or techniques in the form are very subtle, and each may have many variations of their self-defense applications as well. This is unlike some other external styles of martial arts where you might be able to easily guess the application of the moves in the forms simply by watching what the practitioner is doing. Tai Chi uses the entire body to generate power from the ground (Earth/Yin force) and from above (Heaven/Yang force). The Earthly circle of power generation is accomplished by exhaling while sinking and rooting. You first absorb, yield, close, and gather your opponents force and power, emptying them out. Then you inhale and use the uprooting energy from the ground first through the soles of the feet by turning on the heel of the back heavy foot, then straightening the back leg to enable the use of the turn of the hips and the torque of the waist to thus channel the Earth’s power through the body up the back and out through open shoulders to the arms, to the hands, creating a “snap or focus”, a short penetrating power at the end of each technique (no inch strike). The Heavenly circle of power generation is accomplished by first being light, inhaling and intercepting, yielding, redirecting, rising first and then while exhaling sinking and closing, still creating the Ging focus/snap at the end of the strike. The entire mind/Spirit moves the body, the hands and the legs, always as if the entire body is one coherent single connected unit. How much more power is there when the whole body is one single unit, one mind, ONE MUSCLE? The Yang style Tai Chi long form that we practice today at Northern Praying Mantis & Tai Chi Martial Arts Center is derived from the teachings passed down by Yang Luchan (1799-1872) who learned from Cheng Chang-Hsing who was of the Chen family of Chen Village, Hunan province. He was the first non-Chen family member to master the art and allowed to teach it outside the Chen Village. Scholars generally agree that the Tai Chi teachings were somehow delivered to the Chens and developed by the Chen family. Historical records reveal that Tai Chi Chuan was created during the late Ming/early Ching dynasties, or almost 400 years ago, however, the Taoist principles it embraces are thousands of years old. Many assert Tai Chi Chuan originated from a Taoist Immortal named Chang San-Feng. He combined movements of the snake and crane along with various boxing styles that were most effective and popular among the people and the army during the Ming period. Added to this was the ancient Chi Gung meditation and breathing techniques, Taoist Ying/Yang theory, and Chinese medical knowledge concerning circulation of the blood and Chi (energy) to form a martial art that trains both the external and the internal. From ancient documents dated back from the 1600s the Chen family was originally from Shanxi, Hong Dong (). Amongst the Chen clan family members, Chen Xiao Wang (), Chen Zheng Lei (), and Zhu Tian Cai (), there was a family art which Chen Bu (the founder of Chen Jia Gou) brought with him to the village. The family had brought this martial art from Shanxi when the clan was forced to leave. While there were few written scriptures, this history should not be dismissed too quickly because Shanxi is also the traditional origin of Bagua Zhang and Xingyi Chuan, which share some of the bio-mechanical foundations with Tai Chi Chuan. First generation, Chen Pu (), shifted from Shanxi to Wen County, Henan Province (). Originally known as Chang Yang Cun () or Sunshine village, the village grew to include a large number of Chen descendants. Because of the three deep ravines (Gou) beside the village it became to be known as Chen Jia Gou () or Chen Family Village. The village has since been a center of tai chi learning. Ninth generation Chen Wang Ting () is credited as performing the first formal codification of Chen family martial art practice. The development of Chen Style Tai Chi Chuan centered around Chen Wang Ting () between the time of 1600-1680, who codified pre-existing Chen training practice into a corpus of seven routines. This includes five routines of tai chi chuan (), 108 form Long fist () and Cannon Fist (). Wang Ting is said to have incorporated theories from a classic text by General Qi Jiguang (), Jixiaoxinshu () “New Book of Techniques from Different Schools”, and Huang Di Nei Jing () "Yellow Emperor’s Canon of Chinese Medicine”, which described martial arts from 16 different styles. According to Chen Zheng Lei, citing works from oral tradition, it was in Chen Wang ting’s time that Jiang Fa (), Jian Bashi, was captured by him. 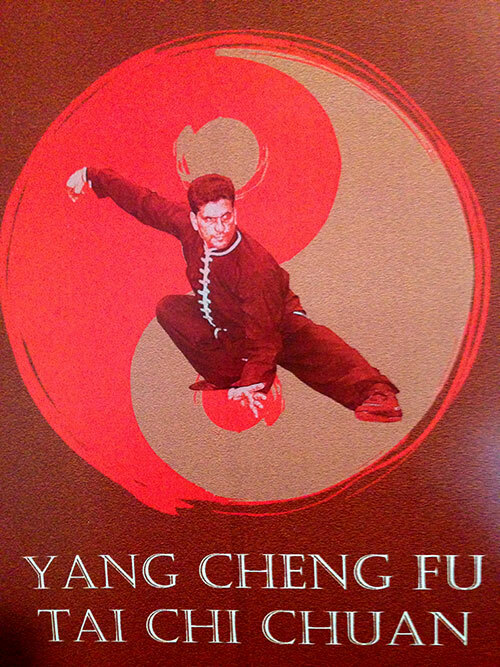 Jian Fa was a skilled martial artist in his own right. The two became very close friends and their exchange of ideas was fruitful. A portrait of Chen Wang Ting, with Jiang Fa behind him is often reproduced. Perhaps the best known Chen family teacher was 14th generation Chén Chángxing (() or Ch'en Chang-hsing, 1771-1853). He further synthesized Chen Wang ting’s open fist training corpus into two routines that came to be known as “old frame” (-lao Jia). Chén Chángxing, contrary to Chen family tradition, also took the first recorded non-family member as a disciple, Yang Luchan in 1820, who went on to develop his own family tradition, Yang style tai chi chuan. Tai chi proved very popular and the other three traditional styles of tai chi chuan further sprang from Yang family tradition, some of these styles also borrowing from the Chen family "Small Frame" tradition. Chen family teaching remained hidden and was not taught publicly until 1928. Chen You Ben (), of the 14th Chen generation, is credited with starting a mainstream Chen training tradition that differed from that credited by Chén Chángxing. It was originally known as “New Form” () as opposed to Chén Chángxing’s loa jia. It gradually become to be known as “small form” (-Xiao Jia). Small Form eventually lead to the formation of two styles with Chen family influences, Zhaobao jia and Hulei jia (thunder), which are not considered a part of the Chen family lineage. Yang Luchan had two sons whose names were Yang Pan Hou (1837-1892), and Yang Chien Hou (1839 - 1917). He also had three excellent students besides his two sons; they were Wang Chun, Ling Shah, and Chuan You, all imperial guards. Wang Chun had mastered the hard energy aspects of Yang's art, as it was based on softness; this is considered to be the lowest level of mastery. Ling Shan mastered the soft energy of Yang's art, which was considered to be the mid level of mastery. Chuan You was the one that mastered the highest level of tai chi chuan, which was called the transformational energy of Yang’s martial art. He processed the ability to switch from hard energy to soft energy at will. Yang Pan Hou was perhaps the most proficient fighter ever produced by any style of tai chi chuan. He studied the large frame from his father and the small frame from his father’s student, Wu Yu Hsiang, which has no relation to the Wu Style Tai Chi Chuan. Pan Hou concentrated his training in the explosive movements of the small frame. Yang Luchan's son Chien Chien Hou taught two successors, Chao Hsiung (1862 — 1930), and Yang Cheng Fu (1883—1936) who both taught the Traditional "Old and Expansive" style which was described as "open and soft.... like a needle concealed within cotton”. Yang Cheng Fu was a powerfully built imposing figure of 300 pounds in his later years. He was known to be kind, good natured and very popular with all his students. Even generals humbled themselves before him. Yang Cheng Fu had only a few disciples that passed on his art, some of which were Fu Zhongwen, Chen Wei-Ming, Chen-To and Tung Ying-Chieh. Fortunately, Yang Cheng Fu dictated all the family teachings (the “Yang Family 40 chapters”), to his disciple Chen Wei Ming, and this precious information is available to us to study today. The translation of this book is this schools’ reference material, that we discuss, analyze and use. Wu Yu Hsiang was a scholar from a wealthy and influential family who became a senior student (along with his two older brothers Wu Ch'eug-ch'ing and Wu Ju-ch'ing of Yang Luchan. He also briefly studied with a teacher from the Chen family, Chen Ch'ing-p'ing, to whom he was introduced by Yang Lu Chan. Wu Yu Hsiang additionally was influenced by his family's discovery of Wang Zhong-Yueh's classic, The Treatise of Taijiquan. He formulated a new distinctive small frame style with compact, subtle movements and high stances. The emphasis is on bodywork, posture, equilibrium, sensitivity and the exertion of inner power and chi development. The body is held in a straight and relaxed position during stepping, weight shifts, and waist turning, with each hand controlling its own side of the body and generally not crossing. The hands are not stretched out beyond the foot and toes. The style emphasizes strictly on rising, falling, starting, connecting, and opening and closing states within the movements. Leading steps are generally followed by a soft empty toe stance of the trailing foot in the closed state stance. Jumps, strength releases, and fajing have mostly been removed from the forms as we know them today. The Wu Hao Tai Chi Chuan techniques are described as the internal feeling should be large while the external display should be small and controlled and synchronous. Wu Yu Hsiang's tai chi chuan is a distinctive style with small, subtle movements; highly focused on balance, sensitivity and internal ch'i development. It is a rare style today, because he came from an influential family involved in government affairs, so he did not transmit his style to a large following. Wu Ya Hsiang famous student was his nephew, Li l-yü (1832-1892), who also authored several important works on tai chi chuan. Li l-yü had a younger brother who was also credited as an author of at least one work on the subject of tai chi chuan, Li Ch'i-hsüan. Li l-yü taught Hao Wei Chen (1842-1920), who taught Li Xiang-yuan, Li Sheng-duan, Sun Lutang, his son Hao Yüeh-ru and others. Sun Lutang later on created Sun style Tai Chi. Hao Yüeh-ru in turn taught his son Hao Shao Ju Wu Yu Hsiang's style of training, so that it is now sometimes known as Wu/Hao or just Hao style tai chi chuan. In the 1920’s, the degree of tai chi chuan was experiencing degree of popularity. Hao Yüeh-ru was known for having smoothed out (in the sense of under-emphasizing jumps and snap kicks, etc.) and standardized the forms he learned from his father in order to more effectively teach large numbers of beginners. While there are direct descendants of Li I-yü and Li Ch'i-hsüan still teaching in China, there are no longer Hao family members teaching the style. The last inheritor to learn under Hao Shao-ju currently living is Liu Jishun, who has many students around the globe but only two disciples in the United Kingdom. Wu Yu Hsiang's art was passed to his nephew Li Yi Yu and then to Hao Weizheug who was instrumental in popularizing the style to a wider audience, thus the addition of his surname to help distinguish the style from the other Wu style. Keeping the tradition of past ancestors, Chuan You taught the art of Yang Lu Chan (transformational energy) to his son, Chien Chuan. The fall of the Ming dynasty came and his son realized that holding a Manchurian surname would be hard to sell the family martial art in China. He decided to change his name to Wu Chien Chuan. He learned the large frame Tai Chi from his father, concentrating on the transformational energy of the style, and the small frame from Yang Pan Hou, Yang Luchan's eldest son. The large frame uses small circular movements in the limbs, while the small frame uses a much larger, and powerful internal circles to produce small, explosive movements in the extremities. Wu Chien chuan uses the knowledge he gained from his father, Chuan You and Yang Pan Hou to develop a small frame with high stance form of tai chi chuan, infused with Taoist meditation techniques, while maintaining the explosive close quarters combat techniques of Yang Pan Hou's small frame tai chi chuan, which became known as the Wu Style Tai Chi Chuan. The Sun style tai chi chuan was developed by Sun Lutang (1861-1932), who was considered expert in two other internal martial arts styles: xingyiquan and baguazhang before he came to study tai chi chuan. Besides his earlier xingyi and bagua training, Sun's experiences with Hao Wiezhen, Yang Shaohou, Yang Chengfu and Wu Jianquan influenced the development of what is today recognized as the Sun style of tai chi chuan. Sun's son, Sun Cunzhou (1893-1963) and daughter, Sun Jianyun (1914-2003) were tai chi chuan teachers, as well as Sun Cunzhou's daughter Sun Shurong (1918-2005) who taught in Beijing until her death. Sun style tai chi chuan is well known for its smooth, flowing movements which omit the more physically vigorous crouching, leaping and fajin of some other styles. The footwork of Sun style is unique, when one foot advances or retreats the other follows. It also uses an open palm throughout the entirety of its main form, and exhibits small circular movements with the hand. The gentle pastures and high stances make it very suitable for geriatric exercise and martial arts therapy. Today, Sun style ranks fourth in popularity and fifth in terms of seniority amongst the five family styles of tai chi chuan. Sun Lutang was also considered an accomplished Neo-Confucian and Taoist scholar, especially in the Yi Jing and the Tai chi classics. He learned Wu/Hao style tai chi chuan from Hao Weizhen, who was Li Yiyu's chief disciple. The Yang Style teachings that were passed by Yang Luchan to his son Chien Chien-Hou and then to his grandson Yang Chen-Fu (1883-1936) who in an interview in 1930 said that Yang Luchan began studying with Chén Chángxing at the age of ten and he did not return home until sometime in his forties. His story is basically that of a poor boy who became a renowned Martial Arts Master to the Manchu princes. He was the foremost boxer throughout the entire empire. Yang Luchan is the recognized founder of a martial art lineage of Yang Style Tai Chi Chuan, which has now become a worldwide movement. However, it is his grandson Yang Cheng’Fu that the world can thank for promoting Tai Chi to its current level of recognition. Yang Cheng’Fu dictated all the extremely valuable oral transmissions given to him directly by Yang Luchan, which today fortunately for us, we have available translations to study in the English language. It was from the Chen family original teachings that Yang Luchan was catapulted from a “humble and poor” status to becoming the “Martial Arts Master to the Manchu Princes”; and it was through Yang Cheng Fu’s educated disciples that Tai Chi has now become adapted for practice all over the world by martial artists, intellectuals, the sick and the elderly. Besides being a highly effective system of self-defense, Yang Tai Chi is now well known for its abilities toward developing a peaceful mind, mental and physical health, flexibility, agility, balance, coordination, and power (internal and external). This form of art, if practiced daily, will also increase breathing capacity and normalizes and strengthens the circulation of blood and Chi energy throughout the entire body, including the brain and all of the internal organs in result with a radiant and health and long life. 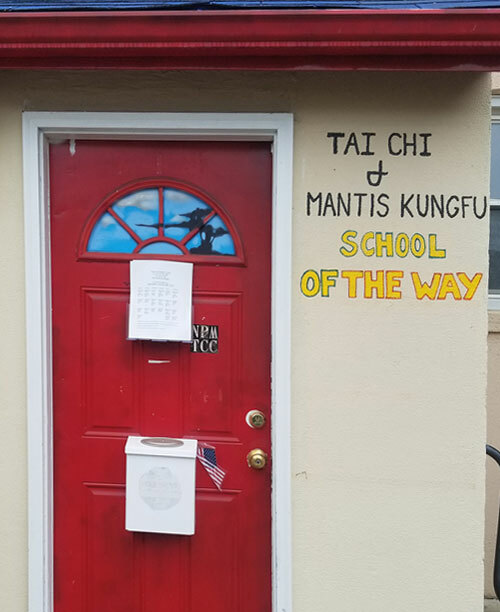 The Yang Tai Chi form taught at the Northern Praying Mantis & Tai Chi Martial Arts Center is based upon Yang Luchan’s original Traditional Long Form which is presently the most popular worldwide. The long form in Chinese is called “Cheung Kuen” meaning “long fist” or, more subtly translated as “endless form”. Tai Chi uses circular motions, which represents the theory of having no beginning and no end. Within the Tai Chi form are numerous distinct postures that can all potentially link together in endless combinations. 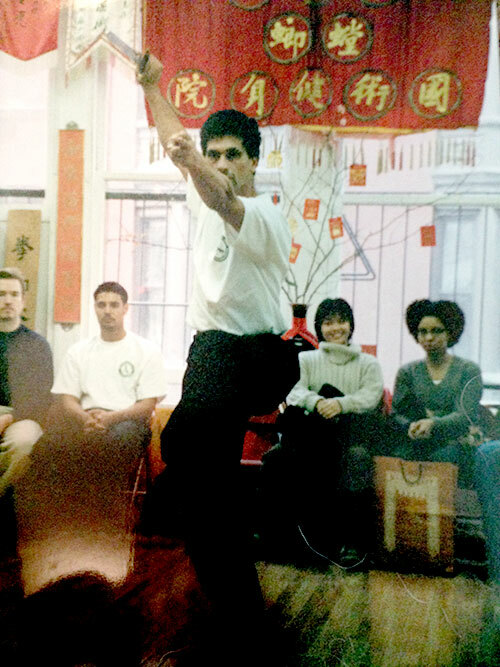 I began studying martial arts in 1976, training in various hard styles of Karate and GUNG Fu. For years I had thought that tightening up my body was the only way to achieve power, until I Joined the Praying Mantis Martial Arts Institute in 1990. Since then, I observed another way of generating power, and a whole new set of fighting strategies and theories. I was not aware of the importance of a calm mind and relaxed body, which is a key theory in both Praying Mantis and Tai Chi. With the patient assistance of my Sifu Tony Chuy, I eventually modified all my previous concepts and retrained my body all over again. Over the last 26 years, I have learned many theories incorporated within both Praying Mantis and Tai Chi. I cannot profess in my short time of practice to yet have a complete grasp of the many sophisticated and subtle theories contained within either system. However, drawing from my own rudimentary experience I will, to the best of my ability, make a comparison between these two synergistic ultimate systems of Gung Fu. Both systems have long and distinguished histories going back hundreds of years. Praying Mantis (created by Wang Lang of Shantung Province}, has origins which date back to the mid-1600's. Since the time when both styles were created, some families or inheritors of the styles subsequently modified the original styles into what they felt were more effective for their own mental dispositions and body types. Thus, several schools or variations of the Praying Mantis and Tai Chi Chuan styles exist today. Praying Mantis and Tai Chi are both complete systems of Kung Fu. Each has its own empty hand, solo and partner forms, internal and external development systems, combinations of flexibility and hardness and include various weapons in their training. The Yang Tai Chi style’s long form that we practice in our school is based upon Yang Chang Fu's modified long form, which is presently the most popular worldwide. Yang Chang Fu was the grandson of Yang Lu Chan (1799-1872) who learned from Cheng Chang-Hsing in Chen Village, Hunan Province. The long form in Chinese is called “Cheung Kuen” meaning "Long Fist" or, more subtly, translated as “endless form”. Tai Chi uses circular motions and circles have no beginning and no end. Within the Tai Chi form exist distinct postures that can link together in endless combinations. So too, in each Praying Mantis form, all the moves link together continuously from beginning to end. This gives the practitioner the ability to link together and interchange as many varied techniques as may be required. Tai Chi relies on sensitivity which enables the borrowing of your opponent's force by following your opponent's moves and to a great extent so does Praying Mantis. Sensitivity cannot be developed unless you are relaxed. The parts of the body that come into contact with your opponent must have some tension to be effective but the rest of the body (and mind) must remain calm and tension-free. There is a Chinese proverb, "Yi Tsing Tzai Dong", which means, “to use quiet to overcome action". Both systems utilize this theory, which is to use stillness to defeat activity. Another saying is "Yi Yao Tzai Gong". This means “to use flexibility to overcome rigidity", perfectly describing the Tai Chi Yin-Yang theory of yielding and issuing and the Praying Mantis theory of not using force against force. Both systems utilize sensitivity to be able to alter their defense or attack techniques spontaneously based upon the changes in reactions of the attacker. In Praying Mantis, you use sensitivity to try to set-up your opponent in the fewest, most rapid series of moves possible to defeat, trap, lock up or take him down. In Tai Chi, you use sensitivity to follow your attacker, then use their power to lead him into an empty off-balanced position at which time you counter attack, or take him down. Tai Chi has a partner sensitivity exercise called “Toi Sao” or "push hands" which is specifically designed to develop “Ting Ging” which means “listening to, or interpreting, your opponent’s power". Praying Mantis has a partner exercise called “Pa Awhn” or “sticking and pressing”, which when practiced at higher levels is comparable to “Toi Sao”, in Tai Chi. Both systems use the entire body to generate power. This is accomplished by first turning on the heel of the foot, then straightening the back leg to use the torque of the waist to thus channel the power through the arms, creating a snap or focus at the end of the strike. In Praying Mantis, we refer to it as “loose and then tight”. Similarly, both systems apply their fighting techniques with extreme speed, utilizing that speed for additional power. Additionally, Praying Mantis uses the “slide up”, in which you use your forward momentum and the "catching up" of your real leg to the rest of your body to project that power like a wave through your body to the point of impact. In Tai Gic, by sticking to your opponent, you may use this “sliding into your attacker” technique as well (such as with shoulder or elbow strikes). Learning the Tai Chi form correctly takes time, patience and perhaps years of concentration. This is not so with a basic Praying Mantis form. The Yang Tai Chi style long form is practiced as slowly as possible to develop your ability to be aware of “conscious movement”: You should be fully aware of the position and movement of your entire body at all times. Once your body is moving correctly and you become familiar enough with the form sequence, you can enjoy the health benefits of Tai Chi. The slow movements of the form combined with slow, deep rhythmic breathing calms the mind and body, which can be likened to moving meditation. This practice greatly reduces stress, which is the number one cause of disease. Tai Chi posture requires the body to be kept in a rounded position. The head is lifted up, chest is concave, shoulders open, and elbows dropped, and the bottom of the spine hanging; which, together allows for the proper ability to deflect or redirect oncoming attacks and to properly use Tai Chi’s fighting applications. Praying Mantis forms should be practiced as if you were actually fighting an imaginary opponent. In both styles, the movements are very subtle. What an observer may see while watching the Tai Chi or Praying Mantis forms does not necessarily reveal the true application of the movement. This is unlike some other martial arts where you might be able to guess the application by looking at what the practitioner is doing. Tai Chi is passive. Its self-defense strategy is to allow your opponent to come into you, use their power, add some of your own and return that power to defeat your opponent after you have led them into a weak empty or overextended position. Praying Mantis is more aggressive: Using cunning, you might intend to confuse your opponent with a sudden feint to the right while attacking to the left. You may attack high or suddenly low while moving in and out and shifting from side to side. In Praying Mantis, your block is a strike and your strike can be a block or part of a locking or takedown technique. Both use various foot trapping techniques. The above comparisons are evidence of the many similarities of the Praying Mantis and Tai Chi styles, along with the few differences. Over 40 years ago, I began with hard external styles of Karate and Gung Fu and I had a difficult time letting go of the rigidity. Without learning Tai Chi, I would have spent many more years before realizing the great value of the inherent power of being of calm mind and relaxed in body. I do believe that Tai Chi and Praying Mantis complement each other and learning them both together is invaluable. Learning Tai Chi will improve and accelerate the study of Praying Mantis and therefore, to me is worthy of practice. I remain extremely grateful that my Sifu, Tony Chuy provided this opportunity to me.